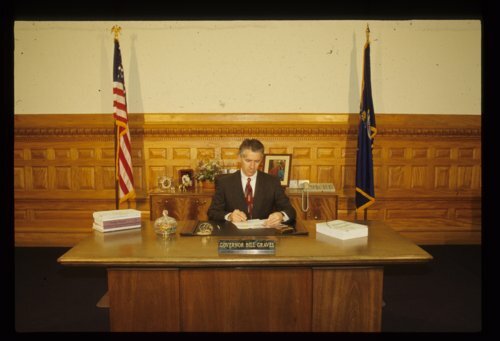 Two color slides showing Governor Bill Graves sitting at his desk in the capitol. Bill Graves was Kansas' 43rd governor. Born January 9, 1953 in Salina, Graves was first elected into public office as Kansas Secretary of State in 1990 and served five years. In 1995, he was elected governor and served two terms. After leaving the governor's office, he accepted a position as President of the American Trucking Association.